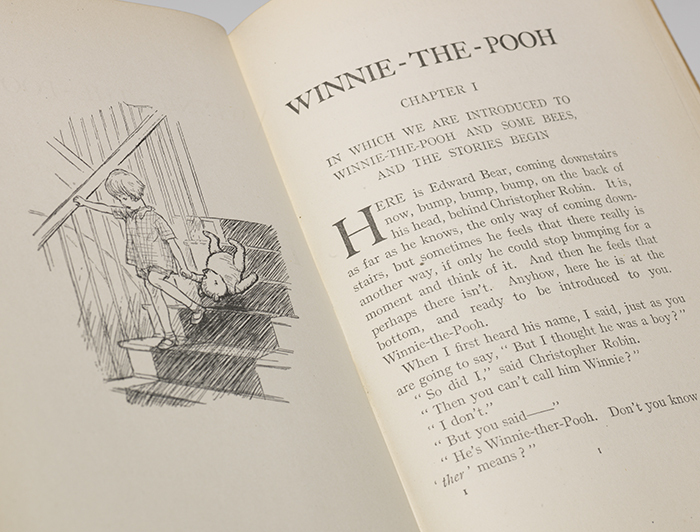 Click here to view our rare books by A.A. Milne. 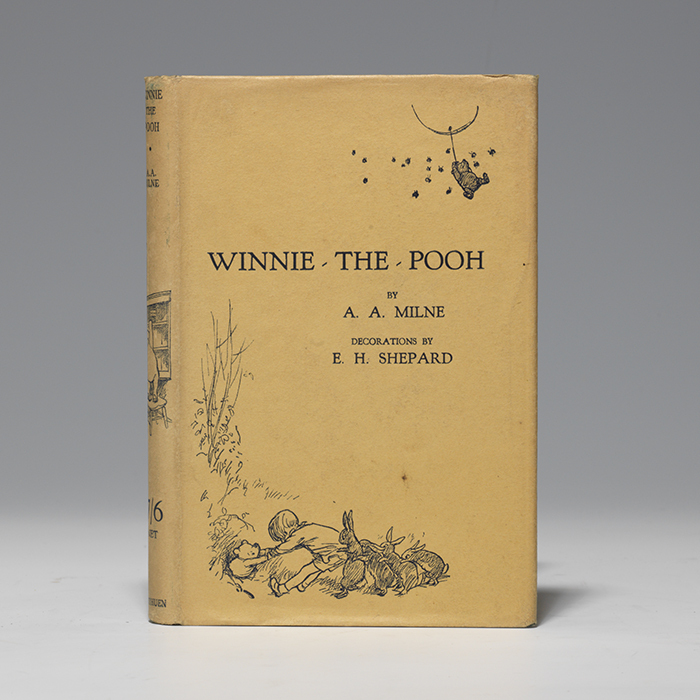 One of the most familiar storybook bears is Winnie-the-Pooh created by A.A. Milne. How did he come to be? Milne was moving along with a career as an essayist, playwright and humorist for Punch magazine. He’d even written a mystery novel, The Red House Mystery (which incidentally, would be his only mystery). However, fellow Punch contributor, Rose Fyleman, asked for some verses for a children’s magazine she was planning. He was a tad reluctant, but during a rainy August holiday in Wales in 1923, he secreted himself away from the guests and wrote verses for eleven days. More were written over the next few months, and eventually, the verses would be collected in When We Were Young, published 1924. It became an immediate bestseller. 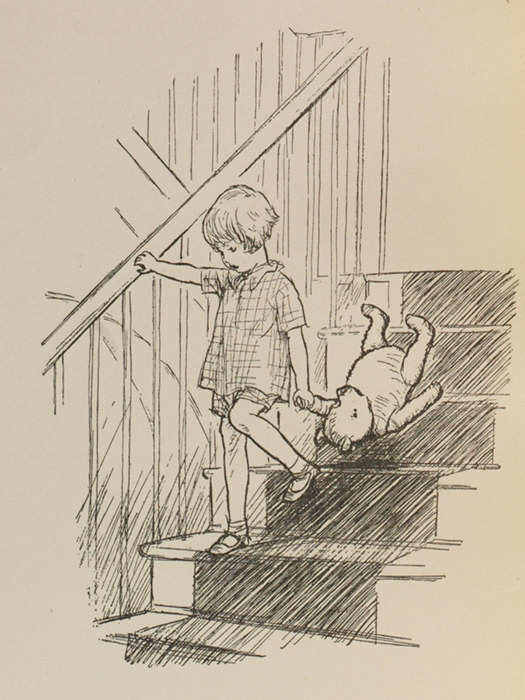 How did the generic “Teddy” of When We Were Young become the unforgettable Winnie-the-Pooh? By way of a little zigzag. Christopher originally named his bear “Edward.” One day, however, he visited the London Zoo and was captivated with a female American black bear, Winnipeg. He decided to name his own bear after her. Milne even alludes to this in the beginning of Winnie-the-Pooh (1926). The other part of Pooh’s characterization comes from the illustrations, drawn by Ernest H. Shepherd, who was also part of the Punch staff. His depiction of Winnie (and the original “Teddy”) was based on his own son’s bear, Growler, as he had not yet seen Christopher Robin’s toys. Milne and Shepherd were a winning combination. 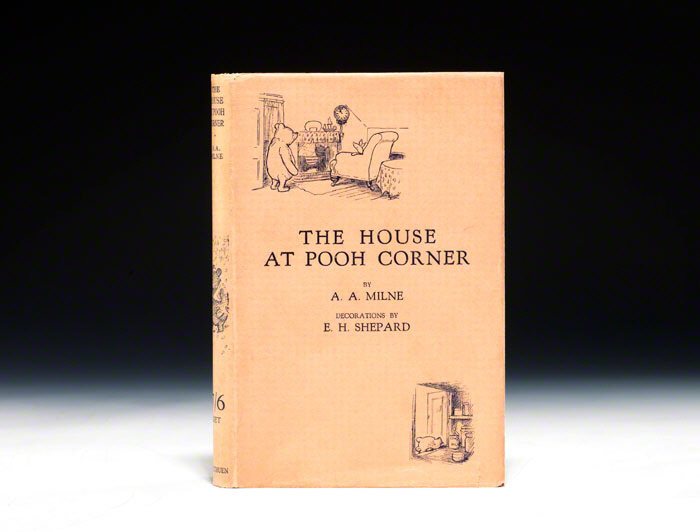 Winnie-the-Pooh would be followed by another book of verse, Now We are Six (1927) and another collection of stories in The House at Pooh Corner (1928) in which Tigger first bounces into reader’s lives. First editions of the quartet of these memorable books are highly desirable. The first book is the rarest as it had the smallest print run. Besides the trade edition (a printing done for the general public), Methuen & Co. also published a large-paper edition of only 100 copies, signed and numbered. 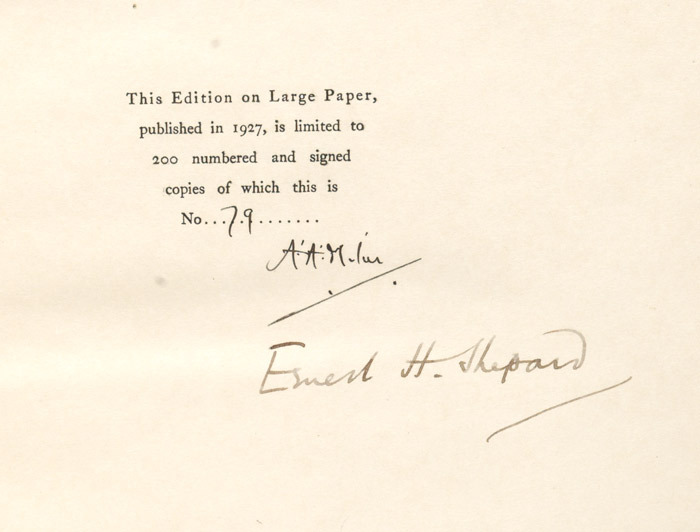 The American publisher, Dutton, issued 500 copies about two weeks later, and only 100 of these were signed by Milne. 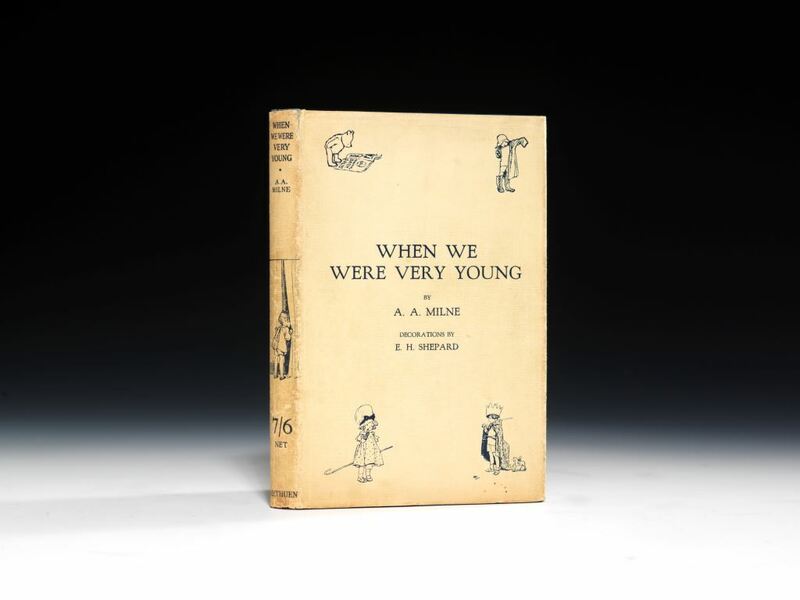 After the success of When We Were Young, both Methuen and Dutton simultaneously issued Winnie-the-Pooh in trade and signed limited editions (350 and 200 large-paper copies, respectively). A similar production was done in 1927 for Now We are Six with a slightly different number of signed limited large-paper copies (200 for Methuen and 250 for Dutton). And, in 1928, both publishers again printed trade and signed limited editions of The House at Pooh Corner; this time 350 for Methuen and 250 for Dutton. If you’re feeling nostalgic or remembering your favorite stuffed toy, maybe it’s time to once again take a stroll through the enchanted Hundred Acre Wood and enjoy the cherished tales of Pooh and friends. 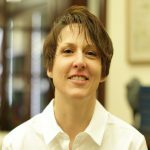 Mary received her B.A. and M.A from Brigham Young University, taught Composition and World Literature at UNLV, and even took a turn as an assistant Contracts Manager for Perini Building when they constructed the Paris Hotel and Casino. Now, she’s delighted to be studying, sharing and selling antiquarian books at the Las Vegas gallery. When she steps away from the books, she loves to bake, garden and hike.